In addition to EAGLE circuit board files, Bantam Tools Desktop Milling Machine Software supports Gerber files. Gerber is a 2D vector image file format, and it’s the industry standard for containing information about a printed circuit board. If you’re going to get your PCB made by a circuit board manufacturer, a set of Gerber files is what they will ask for. Gerber files can describe the copper traces, component placement, solder masks, silkscreen markings, and many other layers or aspects of a PCB. The software can import Gerber files that represent a PCB’s traces and outlines. Excellon files are commonly used to describe the holes on a PCB. Under the hood, the file contains CNC instructions for drilling holes and is often provided to PCB manufacturers with a set of Gerbers. The software can import Excellon files that represent a PCB’s holes. What are examples of software that exports Gerber files? Most PCB design software should be able to export files in Gerber format. Applications we have tested include EAGLE, Altium, KiCad, Osmond PCB, Diptrace, Circuits.io, and Fritzing. There are large variations in how software packages export Gerber files, and some export in a format that is not compatible with our software. If you encounter any difficulties, please feel free to email your Gerber files to us at support@bantamtools.com. Why might you use Gerber files with the software? If you’re using PCB design software other than EAGLE, you’ll need to export Gerber files in order to mill your boards. And since the Gerber format is also widely prevalent in the PCB industry, you can find many instances of Gerber boards online and easily import them into the software. Why do I need multiple Gerber files? Each Gerber file describes a single layer of a circuit board, so multiple files are required to describe a complete board. In some case, each file has an extension that indicates which layer it represents. In other cases, all of the files will end with a .gbr extension and the names will be different. Top traces: describes the shape of the traces and pads on the top side of the PCB. In the software, click File > Open or the Open Files button on the right side of the the software window. Navigate to the directory that contains your Gerber files. Open the Gerber file containing the Top Copper layer. In the resulting dialog, select the correct files are selected for the Bottom (if you’re milling a double-sided board), Outline, and Holes. See the screenshot below for an example. 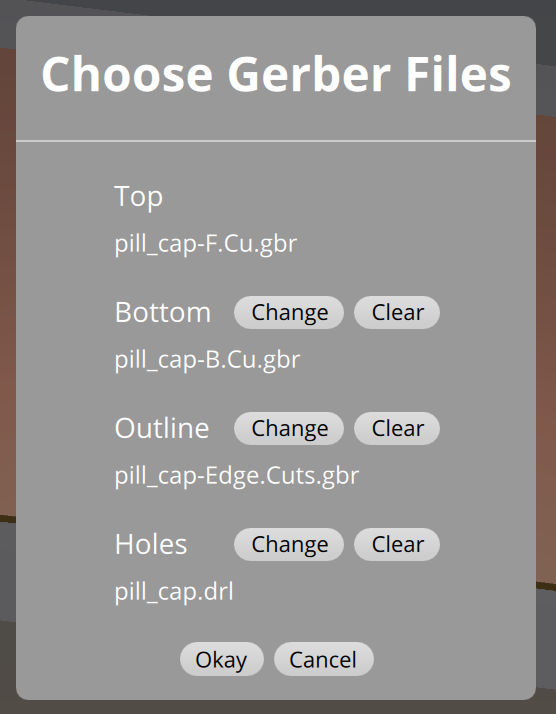 The software attempts to select the rest of the Gerber files for you, but you can override those selections by clicking the Change or Clear buttons associated with each layer. Click Okay to finish opening the files. Import dialog with all files selected. What naming conventions does the software expect Gerber files to follow? When automatically selecting Gerber files, the software supports three common naming conventions for Gerber file extensions. Each of the three sets has a primary file that tells the software to look for optional associated files. Each set of extensions is exclusive, so stick with one for each board. For best results, ensure that your Gerber files are all in the same directory and that the directory includes only one set of Gerbers. .gbr is a generic Gerber file extension that can be used for anything except drills/holes. Upon selecting one to be the top copper layer, the software will allow you to select two more for the bottom and outline layer, plus a .txt drills/holes file. How do I export Gerbers from my CAD software? Because every type of CAD software is different, the process used to export Gerbers with our software will also be different. Here is a list of the CAD software packages we’ve tested, with links to step-by-step guides detailing how to export Gerbers for use with our software. If the software you plan on using is not on the above list, and you're considering purchasing the Bantam Tools Desktop PCB Milling Machine, we recommend downloading our free Bantam Tools Desktop Milling Machine Software and importing your Gerbers. You can also submit a File Cut Request, and we'll happily take a look at your files to confirm. We’ve found the following guidelines helpful when configuring Gerber and Excellon export settings. If you have trouble with Gerbers that you have exported, please send them to us support@bantamtools.com, and we’ll be happy to assist.